In March 2014, Briana Donis was enjoying the ideal year for a high school senior. She was in the top 5% of her graduating class, had been elected homecoming queen of Mayde Creek High School and, best of all, had just been accepted to her dream school, The University of Texas at Austin. In stark contrast to this happy season of her life, Briana received incredibly difficult news. She was diagnosed with Aplastic Anemia, a rare, aggressive bone marrow disease. Briana underwent immunosuppressant therapy as a first course of treatment, but it failed. She then went through chemotherapy, radiation and a bone marrow transplant, in addition to over 100 platelet and blood transfusions. Briana’s bone marrow transplant was not successful and she will undergo a second transplant soon. In the face of incredible difficulty, Briana has remained genuinely joyful and determined to overcome her challenges in order to follow her dream of attending the University of Texas at Austin to earn a nursing degree so that she can provide others with the same excellent care that she has received. 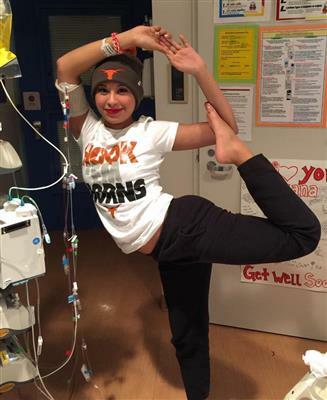 Briana continues to fight her disease with resolve and dignity, embracing her hair loss with an attitude that proclaims “bald is beautiful” and not allowing her IV pole to stop her from practicing yoga poses in her hospital room. Briana and her family are a privilege to serve. In Briana's words, [His Grace Foundation] has been so wonderful to me. During my stay in December, they provided me, along with all the other children on the floor, with gifts upon gifts to try to make our time there, more special. We were all away from our families during the holidays, and they were there to always put smiles on our faces. They are also the foundation that has given us a place to live for the last month, fully furnished, completely paid for. I don't know how we would have done this without them.